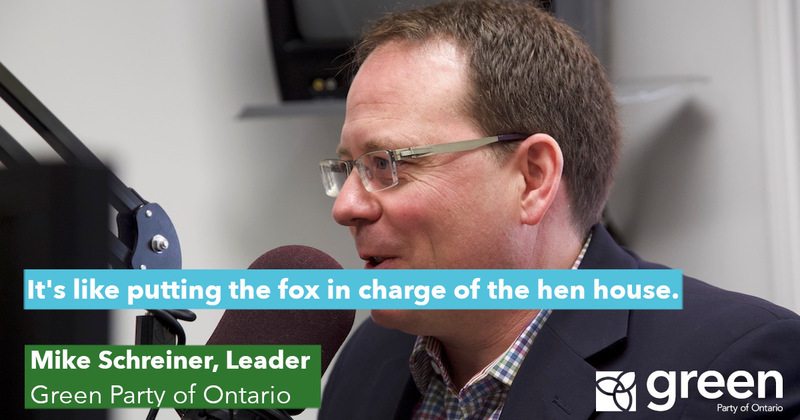 We can unlock housing in Ontario in ways that don’t worsen urban sprawl, threaten farmland or the places we love. “On the first International Day of Education, we should be recognizing how proud we are of our education system, and how important it is to keep focused on the quality of education. Yesterday’s announcement that the Ministry of Education was launching consultations on education that could lead to outcomes such as increased class sizes is worrisome. Is the quality of our kids’ education next on the chopping block? I urge the Minister of Education to listen to the feedback of parents, teachers, students, principals and unions for ways to improve education. “Thank you to the people of Ontario for standing up for the places we love. Thank you to the many municipal councils who passed resolutions to protect the Greenbelt. I will continue to work hard at Queen’s Park to protect the people and places we love in Ontario. And I will make sure Minister Clark follows through on his tweet. Pressuring the government to backtrack on Schedule 10 of Bill 66 is a victory for citizen engagement. People were clear during the election. And they have been clear since Bill 66 was introduced: the people of Ontario want to protect the Greenbelt and clean water. I urge the government to listen to the people and strengthen protections for farmland, water and green space. I’m ready to work across party lines to make that happen. 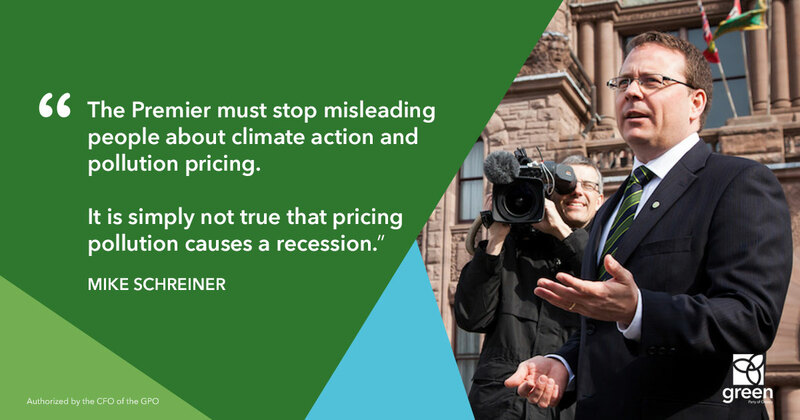 “The Premier must stop misleading people about climate action and pollution pricing. It is simply not true that pricing pollution causes a recession. Alberta and BC continue to lead the country in economic growth and both provinces have carbon pricing in place. In fact, many of the highest performing economies around the world have or are planning to put a price on pollution. Although I was not a big fan of the Liberals’ cap and trade plan, Ontario had its lowest unemployment rate in 18 years with pollution pricing in place. It’s dangerous and disappointing for the Premier to mislead the public about pollution pricing. QUEEN’S PARK -- Doug Ford’s holiday cuts don’t make sense at any level. They fail to make a tangible difference in balancing the province’s books, while maximizing pain for target groups. 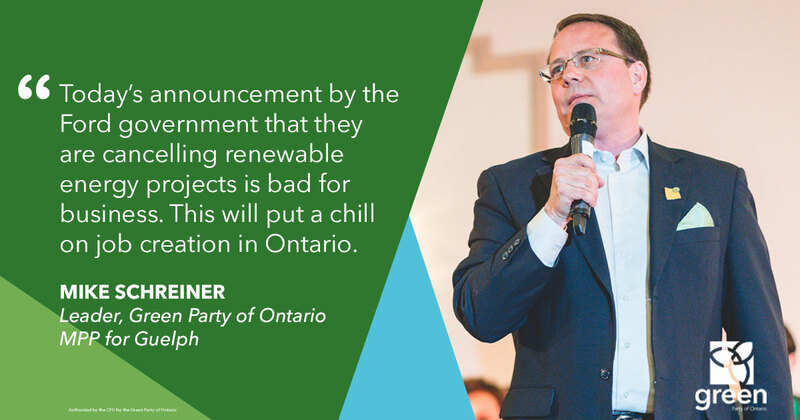 “Today’s announcement by the Ford government that they are cancelling renewable energy projects is bad for business. Cancelling contracts puts a chill on any business wanting to invest and create jobs in Ontario. 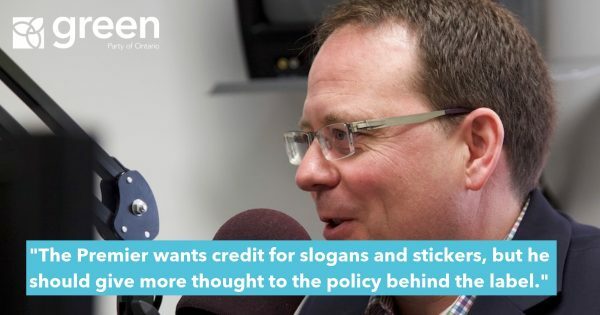 During the election, Premier Ford promised to put up an open for business sign. Clearly the only sign out right now says – in big letters – that Ontario is closed for business when it comes to the $7 trillion clean tech economy. Renewable energy is good for the climate and for our economy. In fact, 274,000 Canadians have clean tech jobs with an average salary of $92,000 per year. The PC government is killing these good jobs. Premier Ford has already misled people on how his hydro actions will save money. He said that the severance of Hydro One CEO Mayo Schmidt would cost nothing. The next day we learned about his $400,000 retirement package and $9 million in stock options. How much will cancelling these renewable energy contracts really cost the people of Ontario? If the PC government was serious about saving people money, the Premier would save $1.1 billion a year by closing the Pickering nuclear station on time. Instead, the Premier is costing us billions by keeping it open past its best before date. Premier Ford is choosing to side with the powerful nuclear lobby rather than fix what’s really wrong with our broken energy system. Queen’s Park – Doug Ford and his PC caucus campaigned on saving money. But their first Throne Speech outlines a political agenda that will cost citizens big time. 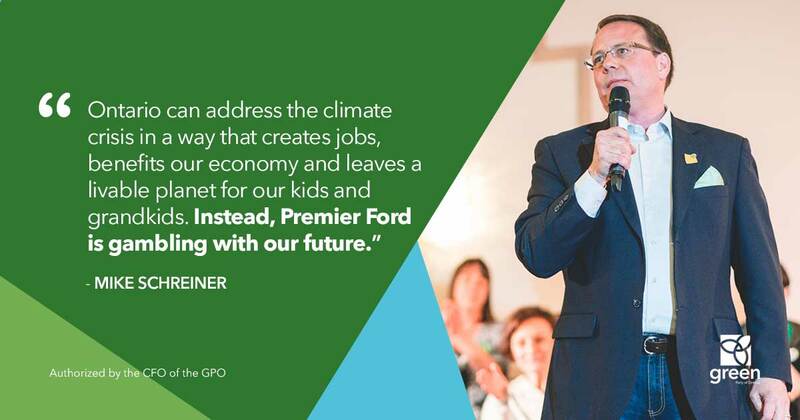 “This plan announces that Ontario is closed for business for those companies wanting to create jobs in the clean economy – missing out on a $7 trillion dollar global economic market,” said GPO leader and Guelph MPP Mike Schreiner. 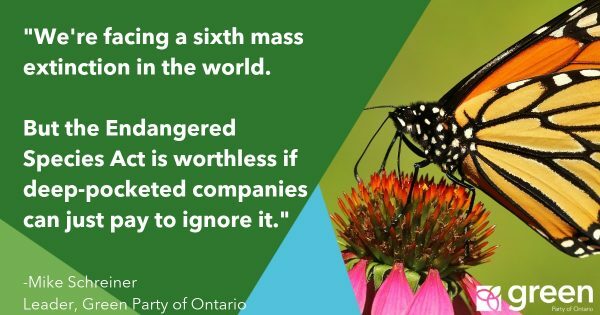 The PC decision to pull Ontario out of cap-and-trade with no alternative plan has created uncertainty for businesses and risk for the people of Ontario, who could be on the hook for paying back the $2.8 billion in now worthless permits purchased by Ontario companies. It could cost even more in legal challenges. “The PC plan will kill jobs and hurt clean economy businesses. 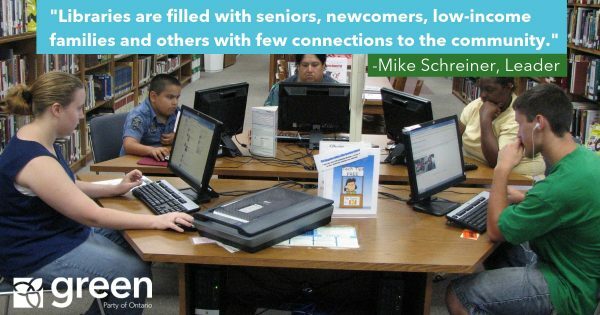 It also takes money out of the pockets of people trying to save money by saving energy,” added Schreiner. 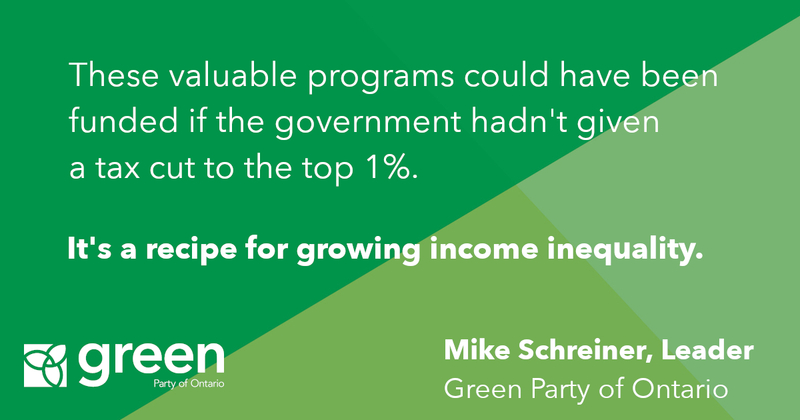 This is a plan that moves Ontario backwards. For example, it will cost $1.1 billion per year to keep the outdated overpriced Pickering nuclear station open past its best before date. 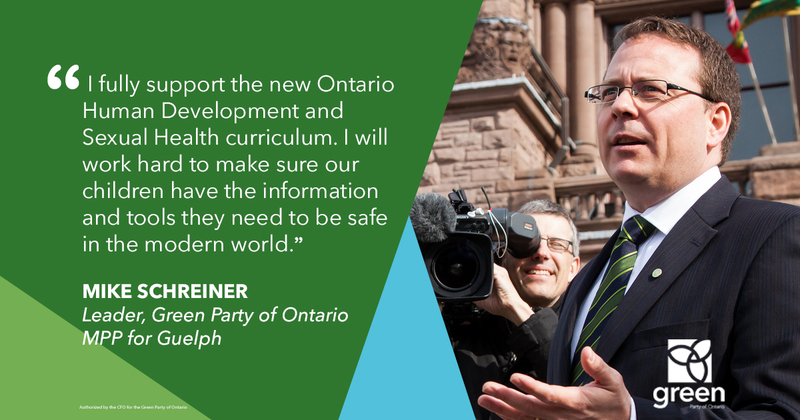 The Green Party supports providing our children with the information and tools they need to be safe in the modern world. Cyber-bullying, sexting, consent, LGBTQ+ rights – these are all important parts of the updated curriculum that are critical to the health and well being of our children. 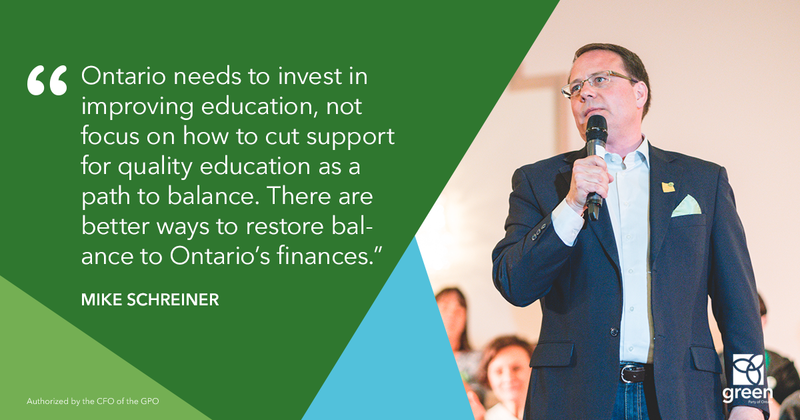 Schreiner and the Green Party will work to push the government to fulfill its commitment to increase support for mental health and addiction services, autism and long-term care beds, and will make every effort to work across party lines to improve important public services. “Premier Ford seems to be declaring war on the modern world. Learning about consent, especially within the context of social media and the online world, is more important than ever before. Our kids won’t be safe if they aren’t informed about the realities of the world we live in. One of the criticisms the PCs are levelling at the current curriculum is that it was developed without adequate consultation. New consultations are promised ‘swiftly’, which begs the question of how adequate new consultations will be. Literally thousands of Ontarians were consulted. It would appear that the Ford faithful were just unhappy with the results. Every child deserves to be protected in a world where sexting and cyberbullying are a reality. Any parent can choose to have their child excused from the teachings of the up to date curriculum if they desire. But the government should not deny parents and students the choice of learning the new curriculum. “Cancelling Ontario’s plan to price greenhouse gas pollution without announcing an alternative is reckless and irresponsible. The Premier could literally put money in people’s pockets by adopting the Green Party’s carbon fee and dividend plan. Premier Ford is telling clean economy companies that Ontario is not open for business. I’m ready to work with the Premier on solutions. Ontario can address the climate crisis in a way that creates jobs, benefits our economy and leaves a livable planet for our kids and grandkids. 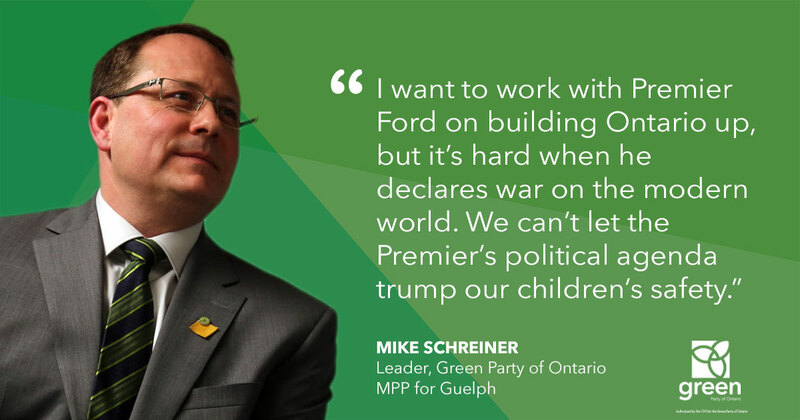 You can also read Mike Schreiner’s open letter to Premier Ford.